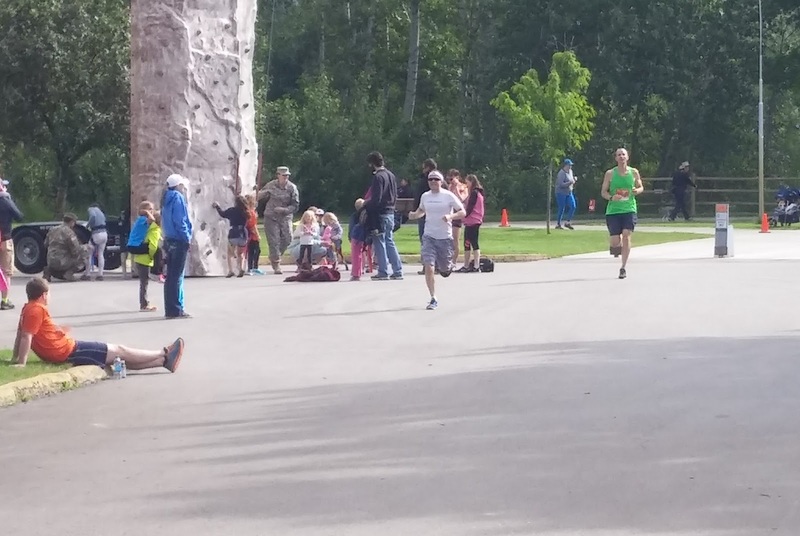 Race Report: Famous Idaho Potato Marathon 2016 – PR and BQ! The Famous Idaho Potato Marathon takes place in Boise, ID, which is right next to my home town. I wasn’t very excited to run it because I’m familiar with the course (it’s a common running path in the Boise area) and it wasn’t a “destination race”. In hindsight, I’m quite impressed with the organization and I had a great experience. I’ve been training hard for a marathon since January. 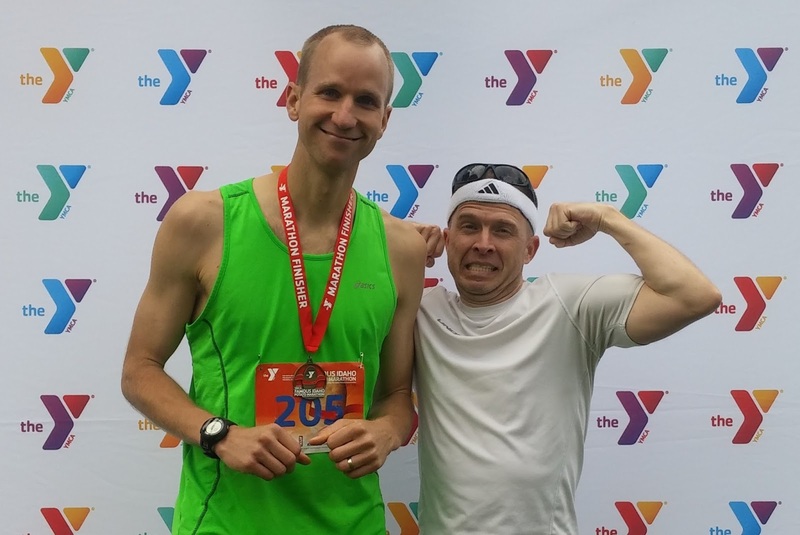 I knew I’d run one in the spring after the Race to Robie Creek, but I couldn’t decide between Western Pacific Marathon, running Newport Marathon again, doing the Ogden Marathon, or running the Famous Idaho Potato Marathon. We ruled out Western Pacific fairly early because I wasn’t confident I’d be recovered from Robie in time. We also didn’t want to take a trip to CA. We ruled out Newport since my in-laws wouldn’t be able to meet us there and it made a drive to the Oregon coast less appealing. I waffled between Ogden and Famous Potato for quite some time. 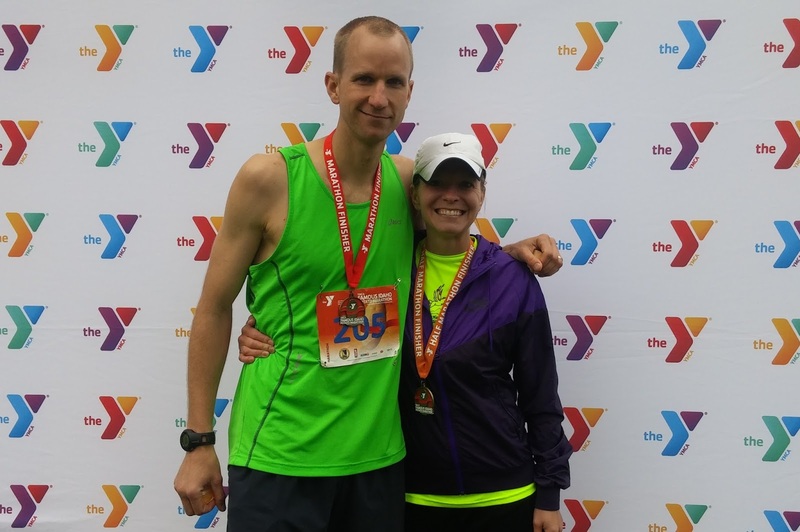 Finally Cyndi said she wanted to do the Half, so easier logistics and much lower cost led me to decide on the Famous Idaho Potato Marathon and Half. I wasn’t really thrilled about this. The Famous Idaho Potato Marathon takes place on Boise’s Greenbelt. 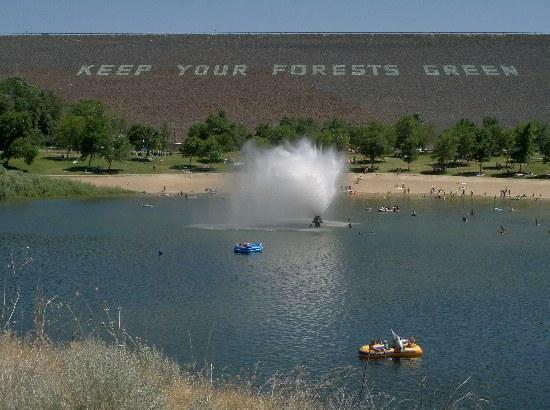 The Greenbelt is awesome — it follows the Boise River from the Lucky Peak Dam for 25+ miles through a canyon, parks, trees, and nice homes. The only issue is that I’ve ran hundreds of miles on the Greenbelt as it’s a great place to train locally, so it wasn’t very interesting. The course is basically flat. It has some slight downhill, particularly for the first few miles. There’s about 280 ft of elevation loss from the highest to lowest point, and about 100 ft of gain. The half marathoners and marathoners start at the same time. The half runners basically end at the marathon half way mark, then the marathoners do a ~6.5 mile out-and-back and end in the same spot. My training went wonderfully and I plan on writing a separate post on it. Essentially, I started my training cycle in January and I usually do three quality runs per week: intervals, tempo, and long run. I rest on Sunday and cross train on two or three of the other days doing cycling, rowing, elliptical, and an occasional easy run. My long runs are usually pretty fast — within 10-40 seconds per mile of marathon pace. I’ve been blessed with no injuries or significant issues since December, so my training has been solid and consistent. I didn’t even catch a serious cold. I did a brief taper for the Race to Robie Creek, but otherwise it’s just been a lot of training runs. Leading up to the Famous Idaho Potato Marathon I had one primary goal: run faster than 3:00:00 so I could break that threshold and qualify for Boston. My training was fairly unorthodox, so I wasn’t certain that I could hit it, but I felt like I should be able to. Most marathoners rely on high mileage for improvement. While I have increased my mileage, I still only run ~40 miles per week; however, I also do ~2-2.5 hours per week of cardio cross training, which I believe is equivalent to ~15 miles of running (although this violates the “specificity” guidance). The point is that I wasn’t sure what pace I could sustain for 26.2 miles. To get a sub-3:00 marathon I needed to do 6:52/mile. I felt like I should aim for 6:45 to leave a small cushion. I decided to aim for 6:45/mile for the first half at least. If I felt lousy I could slow down to 6:50. Then around Mile 18-20 I hoped to have a kick. Given that the course was on a common running path, my friend, Greg, said he would come and run the final 4 miles with me to keep me company. As an attempt to get some reassurance, I posted some of my training details on a RunnersWorld.com forum to ask for pace advice. The couple people that responded didn’t think I could hit 3:00. At first this caused me to doubt my plan, but then I decided I had to go for it. I really thought I could do it. Since my training leading up to the Famous Idaho Potato Marathon was more intense than I’d done before, I tried to eat a little better. Generally, this meant a little less ice cream (which I usually eat every night), less sugar in general, and more protein. On Monday and Tuesday I ate normally but focused on not over-eating, especially since my mileage was low due to tapering my training. On Wednesday we ate potatoes and ham for dinner. On Thursday we ate rice and fish for dinner. On Friday I ate a ~500 calorie breakfast and a bunch of fruit and half a bagel before lunch. I ate a big salad, a PBHoney, and a yogurt for lunch. Then I ate an orange and a granola bar after lunch. Finally we had spaghetti and bread for dinner. I took it easy on the spaghetti — I was still pretty full from lunch. I ate some peanut butter toast before bed. Then I woke up at 3am and had another PBH, a PowerBar, and some gatorade. I definitely ate some extra carbs on Friday, but it wasn’t too egregious. On Monday through Thursday I didn’t really eat much more than I burned (I even counted calories a couple days to make sure I got it right). In other words, I didn’t gorge myself with carbs, I just tried to shift my diet to be more carb-heavy. * I’m writing all this mainly just so I remember it next time I’m planning my pre-marathon eating. We took the kids to packet pick-up after dinner on Friday. It was nothing spectacular, but it was nice to get out and get excited. On Friday night my quads seemed tired, which was odd since I didn’t do anything on Friday. i think it was just pre-race jitters. Also, my left calf had been hurting all week and I was a bit worried about it. Luckily it seemed to loosen up on my runs after I got going. I was mostly concerned that it would cramp up at Mile 20 or something. Cyndi and I watched Gattaca before bed — a favorite inspirational movie of mine. “There is no gene for the human spirit.” We were in bed a little after 10:00. I slept well until 3am, and then ate a bit and laid in bed until about 4am. All week the weather prediction included a chance of wind and thunderstorms, so I was happy to see that there was a small chance of rain and the wind was calm. My mom arrived at 5am to stay with the kids while Cyndi and I raced. The bus ride went smoothly and we were at the starting line at 6am. A friend from work, Rusty, was doing the marathon despite hurting his knee just weeks before. It was a little risky for him and there was some uncertainty whether his cortisone injection would be sufficient to get him through it. We bumped into each other before the race and sat on the road while we waited for go-time. Cyndi and I a few minutes before starting the Famous Idaho Potato Marathon. You can see the pace signs on the left that helped everyone line up correctly. Finally it was time to start. They had nice signs with different paces to help runners line up according to their expected pace. It was really nice — I was up in front of the 7:00/mile sign and it wasn’t crowded at all. (I have a feeling that these work extra well in Idaho. Anyone that’s driven here may know what I mean.) My friend, Chad, was running the half and we lined up together and chatted a bit. (One funny guy was having his friend take his picture while he stretched next to the 5:00/mile sign.) The pace signs made for a smooth start after we sang the national anthem and the gun was fired. My goal for the first mile was to stay under control. We started just below the Lucky Peak dam in the Sandy Point park, wrapping around the little pond there and then advancing onto the highway. I caught myself speeding up a couple times and I reeled back. I ended up being able to hit my splits just about right for the first few miles. There were lots of half marathoners and it was good to have some company. At about Mile 2 I found myself next to a marathoner (marathoners and halfers had different bibs). We chatted a bit. He was going for 3 hours +/- 5 minutes. I told him I was in the same boat. After running next to him for a mile or so, I decided I was going a little too fast so I eased up and he went ahead of me. His name was Kevin. I was expecting my heart rate to be in the low 150’s as long as I was between 6:45 and 6:50, but it was stubbornly around 160 beats per minute. This concerned me a little but I decided that it may just be because I was excited and had a little caffeine in my system from the Gu Energy Chews. There were some slight downhill portions in the first 6 miles, but I really didn’t go much faster than my target pace. In fact, my pace was right about 6:47 for the first 4 miles. In 5 and 6 I was slightly faster and the runners started spreading out a bit. There was a definite breeze which I wasn’t happy about. Admittedly, I tucked in behind a couple halfers at one particularly windy point and used them to draft a tad. They were going a little too fast though, so I ended up letting them go. My running friend, Jon, was on the sidelines and I saw him a couple times cheering us on, so that was nice. It’s always nice to see a familiar face, even early on. During Mile 6 we made a turn then another turn a half mile later into Barber Park. Up to this point the race had been on the outskirts of Boise. The rest of the race would be right along the river in town from this point on. I was trying to drink lots of water/gatorade, but the stations weren’t filling the cups very much. I started grabbing two cups to ensure that I got enough. I wanted my stomach to be sloshy with liquid. I was eating Gu Energy Chews. I ate three pieces (~70 calories) before starting. Then I ate about one every mile or two. I was also monitoring how I felt. My calf was a little tight, but seemed ok. Overall I really felt great and the cool weather (<50F) made me happy. I found myself running about 30 yards behind a half marathoner — I believe her name was Rebecca — and there weren’t many other people around. We were moving pretty well. The course was a little windy through the Greenbelt and some neighborhoods. Keeping someone within sight was nice for both my pacing and my psyche. In fact, having the half marathoners around was really nice. I could see some of them farther ahead and occasionally we’d pass someone. I caught up to Rebecca around Mile 10. She said “Just a 5k to go!” to which I replied “Plus a Half!” We ran together for a couple miles. She was studying at BSU and loves the Boise area. So do I! Everything is green this time of year and it’s a great place to run. I was a little concerned about pace, but I recently read in “Advanced Marathoning” that sticking with a group can be worth 5-10 seconds in pace. I think this is true so I didn’t mind going a little fast. At miles 10-12 I was under 6:40/mile, but I was feeling comfortable so I didn’t fight it. My heart rate was still higher than I wanted. I had fretted over it for most of the race so far, but I finally decided just to ignore it and not worry about it. The good thing was that it didn’t seem to be creeping up a ton — it was still in the low 160’s. I ate my Honey Stinger Waffle around Mile 11 and thoroughly enjoyed it. I love those things. I limited myself to one for this marathon since they are too dry for me to swallow after running for a couple hours. Rebecca started speeding up during Mile 12 so I started falling back. Before Mile 13 the half marathoners turned left to cross a walking bridge and complete the Famous Idaho Potato Half Marathon. The runners immediately thinned out. Kevin was about 40 yards in front of me with another runner, presumably Placido, about 20 yards ahead of him. I knew the second half of the Famous Idaho Potato Marathon would be lonely. The halfers were nice to have up to this point, but I had tried to prepare myself for being alone during most of the second half. It was nice to see Kevin and Placido ahead of me, and this is how it was for the next 6 miles. A couple times the stretched their lead on me a bit, but they were pretty much always within sight. Again, I thought about the “group running” advantage and I determined to stay with them even though the pace was about 5 seconds faster than my 6:45 target. In any case, I was feeling quite well. At Mile 16 the thought occurred to me that one of my regular training loops is 10.25 miles long. I started visualizing myself at a point on my loop corresponding with the distance I had left. This helped put it into perspective. I’ve probably ran that loop 10 times in the past few months. I could do this! At Mile 18 I realized I’d never felt this good at Mile 18 during a marathon before. My right hip was tight and my calves were a little tight, but nothing too concerning. I focused on good form and kept going. I was still drinking water, but I was getting to the point where I felt like puking. I ate my last Energy Chew by Mile 20. My friend, Greg, yelled my name from a distance as I passed him at Mile 18 or so. It was good to see him and I knew he’d join up with me on my way back. I started what felt like a bit of a surge around Mile 19. Kevin had started gaining on Placido, and I had started gaining on both of them. As we approached the turn-around point for the Famous Idaho Potato Marthon, we passed the first three runners. Runner #1, Eric Fitzpatrick, was a good 12 minutes ahead of us. Runners 2 and 3 were farther back, but I had no idea whether I could catch them or not. Placido was definitely slowing a bit, and I passed him at the turn-around cone. It was good to be heading back. I was grateful that he and Kevin had been in front of me to keep me company during the past 6 miles. The course was now slightly uphill. Much to my dismay, there was still a headwind. I really don’t understand how we had a headwind going both directions! It was a bit stronger going back somehow. In any case, I had a bit of a surge and despite the slight uphill and the breeze I pulled a 6:41, 6:39, and 6:39 at miles 20, 21, and 22. Rusty was coming “out” as I was coming “back”. We expected to pass each other a little after the Mile 20 marker and I was watching for him. Sure enough he came by and I cheered him on and he did the same. He also gave me a thumbs down, indicating his knee was getting the best of him. I still hoped he’d have an ok finish. I passed Kevin by Mile 21 and then passed runner #3. Runner #2 was up ahead about 150 yards, but I knew I was gaining on him. I felt really good when Greg started running with me around Mile 22. 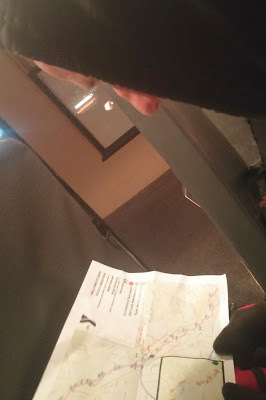 Greg and I talked a bit and I set my sights on runner #2. I told Greg that I was feeling well. He told me some stories and encouraged me to keep going. We passed runner #2 at Mile 23 or so. I started getting quiet as The Wall finally caught up with me. My calves in particular were locking up and I was fighting to keep the pace going. I heard footsteps behind me and around Mile 24 Kevin overtook me and Greg. I was surprised it was Kevin, as I thought it would be the guy we just passed. I continued taking cups of water/Gatorade, but I just spit it out as I couldn’t bear the thought of swallowing anything else. My pace slipped over 7:00/mile for the last two miles, but by Mile 24 I was confident I would hit my target. 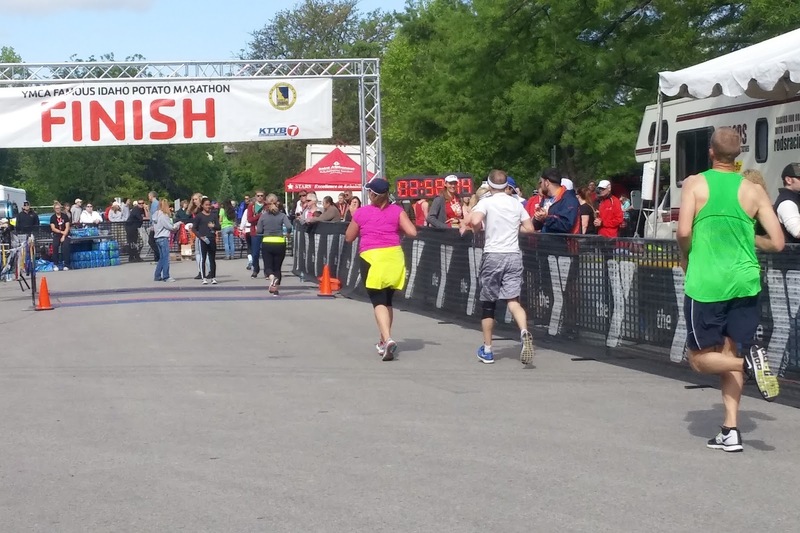 The last couple miles were painful, but I didn’t reach the point of total physical and psychological exhaustion that I have reached in other marathons. Greg kept me company as we finally made it back to the walking bridge and headed for the final few hundred yards. At one point he asked if I could catch Kevin and I said “No”. By the end, Kevin had a decent lead on me. We came into the final straightaway for the Famous Idaho Potato Marathon and I saw Cyndi cheering me on in the crowd. I crossed the line at 2:58:15! That beat my goal by 0:01:44 and gave me a new personal best! It was also good enough for 3rd Overall at the Famous Idaho Potato Marathon. I actually didn’t feel too terrible after the race. I walked around a bit and tried to loosen up. Cyndi came and gave me a hug. She ran her half in 1:52, which was her personal best, so it was a great day all around. I wanted to eat but had to let my stomach get back under control before I dared. I started with water, some chocolate milk, and then a bagel. Greg, Cyndi, and I talked but I had to keep moving every once in a while as my calves were tight and burning. I ran into Kevin and congratulated him on the strong finish. He’s also from Meridian. I also ran into Rachel Powell, who I ran with in high school (she was a grade ahead of me). I saw her during the out-and-back and she ended up winning the women’s marathon. She told me what a great experience Boston and got me excited to go. Post race photo with Greg. I was happy to be done, happy to have hit my goal, and feeling pretty good considering I just ran 26.2 (26.4?) miles. 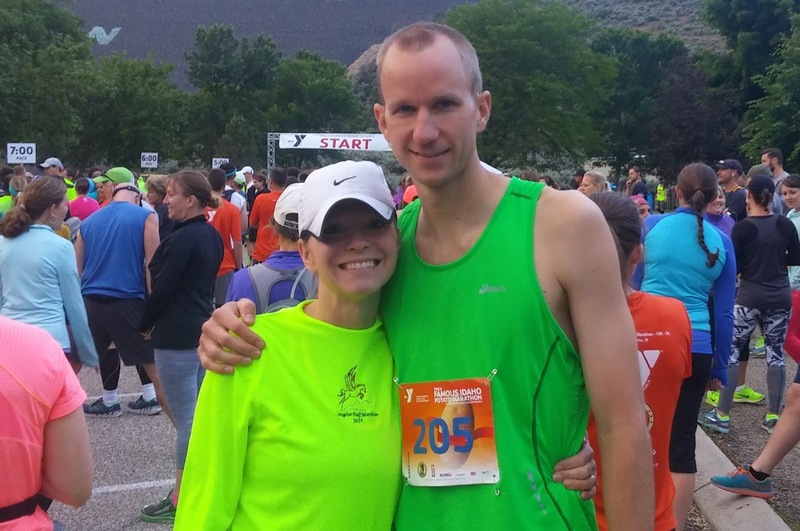 Post race photo with Cyndi after the Famous Idaho Potato Marathon. PRs for both of us! Right as we were leaving I determined I was ready for a baked potato, so I grabbed one for the walk back to the car. How could I run the Famous Idaho Potato Marathon and not eat a baked potato? They had some Chobani yogurt to put on it and with some salt, pepper, butter, and chives it turned out to be delicious. We went home and ended up having a BBQ with Greg’s family later in the day. I ate a big hot dog, a delicious burger, and a bunch of ice cream and brownies to celebrate. My watch measured the course at 26.4 miles. I noticed a few other people on Strava had measured long as well. Hopefully it was a little long and I was going faster than my official time indicates.